Kaiyuree Moodley and Kaylah Williams both rallied brilliantly to cross the first hurdle in the match play stage of the 2018 IGU All India Ladies Amateur Championship at the Tollygunge Club golf course in India on Wednesday. ‘Both girls had really exciting matches,’ said Womens Golf South Africa president Sally Greasley. ‘Kaiyuree went 1-up on the second, but lost the third and the match was tied until she holed a great putt at 13 to take the lead again. She slam-dunked an eagle at 14 to go 2-up and a good drive and great approach on 16 set up another birdie opportunity. She holed the putt to go 3-up. ‘Her opponent drove it into the hazard on the left at 17, and her penalty drop allowed her just enough room to punch out onto the fairway. Kai hit a lovely straight drive up the fairway, was on the fringe for two and chipped it to give. Game-over. ‘Kaylah was 3-up through six. She cruised along, hitting lovely straight drives, but her opponent held her own and they halved the next seven holes in pars. Kaylah never looked uneasy or uncomfortable and she certainly put pressure on her opponent. Her game ended on the 14th hole after a great second shot into the green which left her with a short putt for par,’ Greasley added. ‘I was extremely proud of both girls’ determination to up the ante and win their matches. Off the course, they have both made several friends and, as the only “foreign” team, they are much in demand for interviews and information pertaining to golf for girls in South Africa. ‘We are both over the moon with the way we played,’ said 17-year-old Moodley from Gauteng. ‘My match was tough. My opponent kept her spirits up and made very few mistakes. I had to fight to square the match until we got to the 13th hole. Then I won four holes in a row to win. ‘I really struggled off the tee the first two days,’ said the 16-year-old from Bellville. ‘I came to India and I lost my groove and I didn’t feel confident about my game at all. It all changed today. I hit a lot of fairways and greens and if I missed a green, I almost always guaranteed myself an up-and-down to save par. ‘I won the first two holes, lost the third but won four, halved five and won six. Over the first two rounds, I doubled the 12th hole twice, but today I hit the fairway and chipped in for a birdie, which really gave me a real lift. I had a two-putt to win on 14 and I told myself to rather guarantee the win. I hit the fairway, hit the green and made the two putts to win. 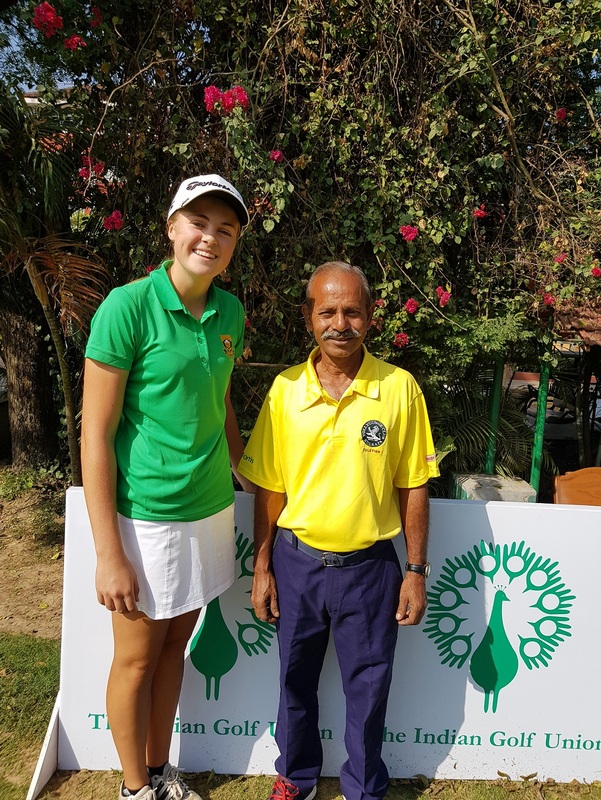 Photo: GolfRSA Elite Squad member Kaylah Williams with her caddie at the 2018 IGU All India Ladies Amateur Championship in India, supplied by GolfRSA.